I'll handle it from here, Isabel. I'm sure you will, Jackie. When you review a large number of films in the space of a year, more often than not you end up with a number of films that are difficult to get excited about, and subsequently, it is difficult to be motivated to write a review for them. Furthermore, you also end up developing an extremely low tolerance for mediocre films that merely go through the motions instead of captivating and inspiring. 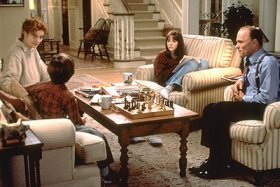 I had just such an experience this weekend, when my patience was tested by the maudlin and cliché-ridden soap opera antics of "Stepmom". That woman is to have nothing to do with my children. Isabel (Julia Roberts of "My Best Friend's Wedding") is a very chic New York fashion photographer who can work miracles with a camera and a roll of film. Young, attractive, and living with Luke Harrison (Ed Harris of "The Truman Show"), her hot-shot lawyer boyfriend, it seems everything is going for her. Unfortunately, Luke has two kids from his previous marriage, Anna (Jena Malone of "Contact") and Ben (Liam Aiken), and they are making her life a living hell. 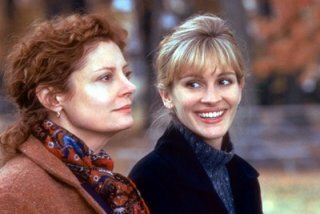 Not only do they resent the fact that Isabel has moved in to live with them, but they always maliciously compare her to their 'real' mother, Jackie (Susan Sarandon). Making matters worse, Isabel is completely unprepared for motherhood, and she struggles to fit her new responsibilities into her hectic schedule. Yeah, I think she's pretty too... if you like big teeth. If you want me to hate her, I will. Of course, Jackie doesn't make matters any easier, as she clearly flaunts her disdain for her ex-husband's new love in front of Anna and Ben, even to the point of questioning Isabel's ability to properly care for her children. But despite these difficulties, Isabel struggles on to become a better mother to Anna and Ben, doing her best to overcome the friction. You think it's easy for Jackie to watch another woman looking after her kids? However, the situation becomes more tangled as "Stepmom" steps into tearjerker mode with the arrival of two life-changing complications: Luke proposes to Isabel, while Jackie learns that she has been afflicted with cancer. In a similar fashion to the earlier and much better "One True Thing", these two women must set aside their differences and do what is best for the family, no matter how painful it is. For Jackie, it means letting go of her contempt for Isabel and allowing her to become a full-fledged member of the family. For Isabel, it means making peace with her soon-to-be stepchildren and finding the self-confidence to raise them as her own. Yup, there's nothing like a life-threatening disease to force a resolution to a sticky situation. Anna! You don't run out on your mother! Can you ever fall out of love with your kids? Add to this a meandering story-line that takes too long to get where it's going, glacial pacing, and a couple of eye-rolling musical set pieces, and you have a truly plodding and pedestrian effort that will have you glancing at your watch more than a few times. This is unfortunate, since Columbus has assembled a bevy of talented actors for this film. Sarandon, Roberts, and Harris play their respective roles to the best of their abilities, though their talents are clearly wasted by the prosaic dialogue that they must endure and the odd changes of heart that their characters undergo. Also, Malone and Aiken are a pleasure to watch, especially Malone, who seems to handle the range of her character with the greatest of ease, and is certain to be a young actress to watch in the future. I really wanted to like "Stepmom", as it really looked promising when I saw the trailer. However, instead of being enlightened by the film, I grew weary with its melodramatic machinations. Instead of creating a heartwarming and life-affirming drama, Columbus has crafted a plodding commercial entity totally bereft of any emotional resonance. What a tragedy. You're not making it any easier for me. It's not my job to make it easier for you... it's my job to look after these children!